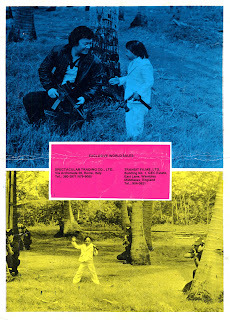 The 1981 Manila International Film Festival was designed by First Lady Imelda Marcos as an elaborate showcase of Filipino culture. 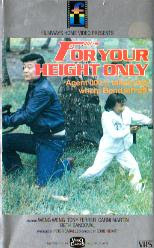 To everyone’s horror, the only film that sold to the world was a midget spy film – a miniature mockery of Western pop iconography, and a joyously naïve celebration of Filipino Goon Cinema - called For Y’ur Height Only. 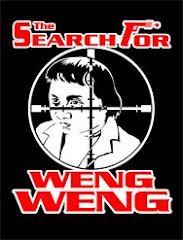 Eddie Nicart, renowned stunt director for the SOS Daredevils, trained Weng Weng every day for three months to be a professional stuntman, and after Agent 00 (also 1981), this was his second opportunity to direct. 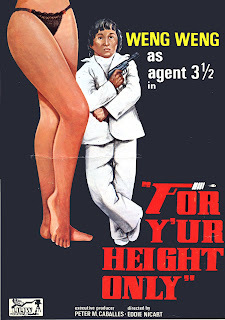 And what a job he did - over the astounding course of the film Agent 00, our curious little brown hero with a receding Ramones bowl cut and an all-white suit and boater, cracks an international drug ring, gets the girl, loses the girl (“Irmaaaaa!”) and infiltrates the secret lair of evil criminal mastermind Mr Giant (played, appropriately enough, by a dwarf named Goliath), all with an armful of gadgets and his famous trick of punching someone in the balls, then running between their legs.